RBTH presents a selection of views from leading Russian media on international events, featuring reports on: the Feb. 24 four-party talks in Parison the Ukraine crisis; the presentation of an alliance agreement between Russia and South Ossetia; the EU’s promise to continue financial aid to Greece in exchange for reforms. The Kommersant business daily reportson the meeting in Paris between the foreign ministers of Ukraine, Russia, Germany and France on regulating the conflict in the Donbass region of eastern Ukraine. 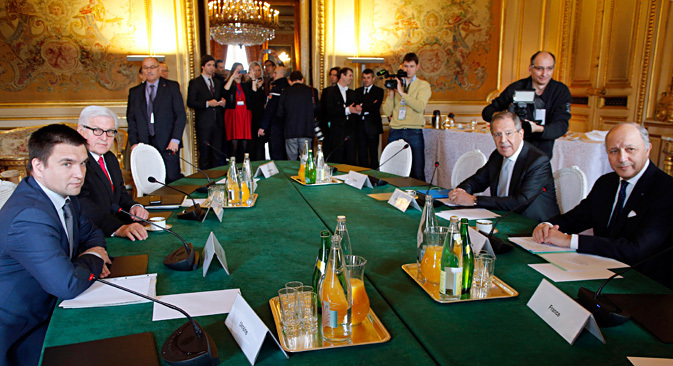 Russian Foreign Minister Sergei Lavrov called the meeting "useful." He emphasized that according to the negotiators' general evaluation, the situation in the Donbass is improving, even though "OSCE observers still note some sporadic violations." Lavrov also said that it is necessary to start the withdrawal of heavy weaponry as soon as possible. According to Kommersant, this statement was an obvious accusation directed at the Ukrainian government, which refuses to commence the process of weapons withdrawal until the ceasefire regime has been fully implemented. Representatives of the self-proclaimed Donetsk and Lugansk “people’s republics” have already agreed on the first stage of withdrawal of heavy weaponry, writes the newspaper. Kommersant reports that the ministers also discussed Kiev's initiative to deploy an international "blue helmet" EU peacekeeping contingent in the Donbass, which did not receive support. Instead, it was decided to substantially strengthen the monitoring mission of the OSCE, which is already present in Ukraine. Furthermore, the ministers agreed to charge the so-called contact group (consisting of representatives of Ukraine, the Donbass rebels, Russia and the OSCE) with the immediate implementation of other points of the Minsk Agreements: the preparation of local elections and constitutional reforms, as well as the establishment of social-economic links and banking services for the population of the territories controlled by the rebels. For all these points to be realized efficiently, subgroups will be created within the contact group, reports Kommersant. Putin to sign agreement of alliance with South Ossetia - the first step to unification? The Moskovsky Komsomolets tabloid newspaper writes that the Russian government has presented an agreement of alliance and integration with the unrecognized Caucasus republic of South Ossetia [a disputed territory that broke away from Georgia with Russian military backing in 2008 – RBTH] to Russian President Vladimir Putin for signature. The agreement has a duration period of 25 years and a possibility of being extended. The newspaper explains that the project includes, in particular, deep integration, primarily on issues dealing with security, customs and the interactivity of power structures. The project calls for the creation of a single defense area, with Moscow protecting South Ossetia's borders. These steps can be viewed in relation to "the military-political situation that the region has found itself in." Moskovsky Komsomolets adds that, according to the agreement, aggression by third parties or illegal armed formations against one of the signatories of the agreement will be interpreted as an armed invasion of the other signatory. The newspaper reminds its readers that President of South Ossetia Leonid Tibilov said in 2013 that he does not exclude the possibility of the unification of the Ossetian people living in South Ossetia with those in North Ossetia, as part of the Russian Federation. The Nezavisimaya Gazeta newspaper reports that the second package of EU aid to Greece expires on Feb. 28. If Greece does not receive the funds remaining in the package, it will be threatened with a default. In that case, the EU will face a political catastrophe linked to the final discrediting of the economy's austerity policies, the undermining of the European currency and the possible “Grexit” – a Greek departure from the eurozone. Nezavisimaya Gazeta writes that Brussels fears that Athens' demands to lighten its burden will be contagious for other countries that are in debt. It is also unknown how Greece will behave in the future concerning the sanctions policy against Russia. However, the EU confirmed its agreement to extend financial aid to Greece until July. As a result Greece can receive the remaining funds, equal to 7.2 billion euros, for another four months. The situation for the EU is rather critical since Greece does not want to follow Brussels' policy unconditionally. The solution that has been found, therefore, remains only temporary, writes Nezavisimaya Gazeta. In the latest survey by U.S. polling agency Gallup, Russia topped North Korea, China, Iran and Iraq as the greatest enemy of the United States.